On behalf of the museum trustees we would like to send out very big thank you the following: all of the visitors, cockpit owners and exhibitors (many who travelled significant distances to be with us), their friends and families; the museum staff, aircraft openers and volunteers who helped during the build-up, during and after the event. We do appreciate it! We would also like to say a special thank you to the former Harrier and Sea Harrier personnel who attended the event and we're sorry that the reunion badge allocation went awry, we will be contacting you directly to explain in a bit more detail about the SNAFU situation! There is a final special mention to everyone who attended the event having faced some quite challenging road closure and diversion situations and busy local traffic to make it through to the event - thank you for your perseverance today. 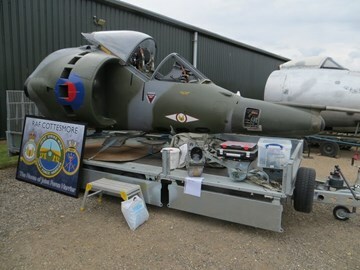 There has been some good publicity associated with the event and we hope that has helped to raise the profile of the type across the world and will help other Harrier related projects.